The War for Southern Independence, or Slavery? Funds are needed to complete the installation of paved walkways and other upgrades for the Confederate section in Oakwood Cemetery in Raleigh. The current project is additions and improvements to the General Joseph E. Johnston statue, located adjacent to the Bentonville Battlefield State Historic Site. With attacks on our heritage on the rise, donations to the N. C. Division Heritage Defense Fund will be crucial in protecting our rights. The Sons of Confederate Veterans is the direct heir of the United Confederate Veterans, and the oldest hereditary organization for male descendants of Confederate soldiers. Organized at Richmond, Virginia, in 1896, the Sons of Confederate Veterans continues to serve as a historical, patriotic, and non-political organization dedicated to insuring that a true history of the 1861-1865 period is preserved. If you are interested in becoming a member, please join us at one of our monthly meetings, held the 3rd Tuesday of each month. Visitors are always welcome! attending our annual Lee-Jackson Banquet. "To you, Sons of Confederate Veterans, we submit the vindication of the Cause for which we fought; to your strength be given the defense of the Confederate Soldier's good name, the guardianship of his history, the emulation of his virtues, the perpetuation of those principals he loved and which made him glorious and which you also cherish. Remember, it is your duty to see that the true history of the South is presented to future generations." Guest Speaker: Dr. Jack Kerwick will present a talk entitled “The South Was-and IS-Right!”. Dr. Kerwick is Professor of Ethics and Philosophy at several colleges, and has written for numerous national publications, such as The Daily Caller and Townhall.com. He earned his BA from Wingate University here in North Carolina, his MA from Baylor University in Texas, and PhD from Temple University. He is the author of four highly-praised books including Misguided Guardians: The Conservative Case Against Neoconservatism and the recently published, Higher Miseducation: A Dissident’s Essays on the Assault Against Liberal Learning. Read Dr. Boyd D. Cathey's article on the event, What happened at Confederate Flag Day, 2019. 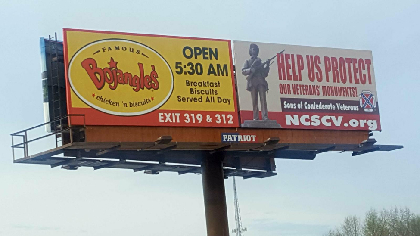 "This new billboard, located on Interstate 95 north in Godwin, encourages support for our "Flags Across the Carolinas" program and bears an image of our I-95 "Mega Flag" located nearby at the General Theophilus Hunter Holmes Confederate Memorial Site and Cemetery." Latest North Carolina Divison SCV press releases, The first press release is related to the billboard on I-40, near the intersection of I-95, advocating the protection of Confederate memorials, while the second press release relates to a reward being offered for information leading to the arrest and conviction of those responsible for damage to the Robert E. Lee memorial located in Pack Square Park in Asheville. 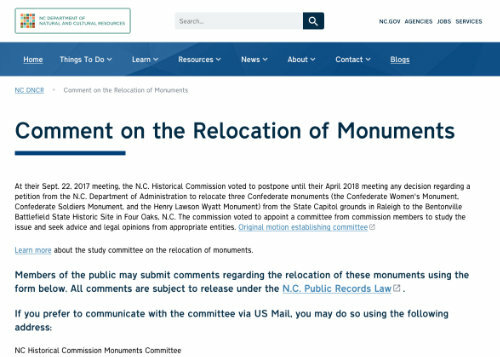 Visit this webpage on the North Carolina Department of Natural and Cultural Resources site to provide comments on the proposed relocation of the 1895 Confederate Monument, the Henry Lawson Wyatt Monument and the North Carolina Women of the Confederacy Monument from the State Capital grounds to the Bentonvill Battlefield. The Abbeville Institute was founded in 2002 by a group of scholars in history, literature, philosophy, religion, and other disciplines who conducted a conference on “Modernity and the Southern Tradition” at the University of Virginia. We were concerned that the Southern tradition is no longer taught in colleges and universities except as a function of the ideological needs of others. With few exceptions, the Southern tradition is presented as little more than the story of racism and slavery. The Institute was formed as a response to this intellectual challenge. Its purpose is to critically explore what is true and valuable in the Southern tradition. To this end, we hold summer schools for college and graduate students as well as conferences for academics at colleges and universities. We also conduct educational conferences for the public. 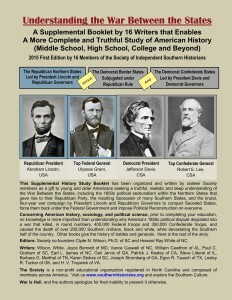 This Supplemental History Study Booklet has been organized and written by sixteen Society members as a gift to young and older Americans seeking a truthful, realistic and deep understanding of the War Between the States, including the 1850s political sectionalism within the Northern States that gave rise to their Republican Party, the resulting Secession of many Southern States, and the brutal, four-year war campaign by President Lincoln and Republican Governors to conquer Seceded States, force them back under the Federal Government and impose Political Reconstruction on everyone. The booklet can be downloaded for free, read online or a version can be purchased at Amazon in a printed version or e-book version. Consider reading the article, Understanding “The Battle Hymn of the Republic” by Howard Ray White, at the Abbeville Institute site, and discover the meaning of the lyrics of this song. A song that glorified John Brown, and even likened him to Jesus Christ. When you shop at smile.amazon.com, Amazon donates to the Col. John Sloan Camp! Our next meeting is Tuesday, March 19th. Arrive at 6:00 pm for meal. Meeting begins at 7:00 pm. Our speaker will be, NC Division Commander Kevin Stone, who present a program on "State of the State". The February 2019 edition of the camp newsletter is now available! Past issues can be found in the Newsletter Archives. The bi-monthly newsletter of the North Carolina Division of the Sons of Confedrate Veterans, The Carolina Confederate, is no longer being delivered via mail to members. Click here for details on current delivery methods.